There is a gradation among the sacred orders. 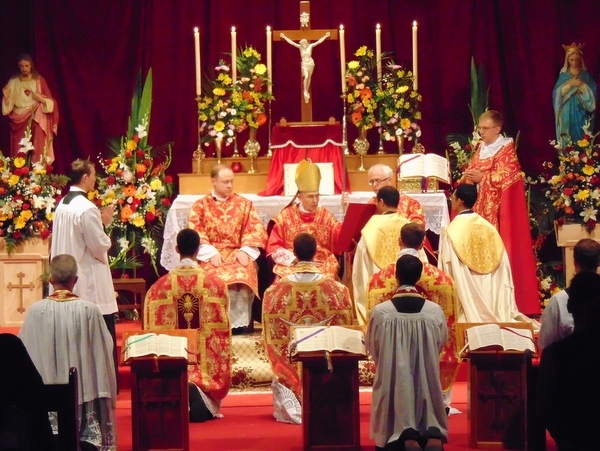 Their various steps – the episcopate, the priesthood, the diaconate, the subdiaconate and the minor orders – form a true hierarchy. The gradual climb to the priesthood through the minor and the major orders is a most ancient custom. The Acts of the Apostles refers to the institution of the diaconate, while Saint Robert Bellarmine, in his writings against the Protestants, teaches us that the institution of the other orders is also of apostolic tradition. The word order implies a hierarchy, whether among things or among persons. The Church is in order because the Church is essentially unequal in her members. She is made up of clerics and laymen. So there is a hierarchy within the Church. That is an essential point, which unfortunately no longer appears in the definition of the Church, in the new code of Canon Law. In what precisely does this hierarchy consist? It consists in a participation in the priesthood of our Lord Jesus Christ. With every ordination, the seminarians receive another degree of participation in the sacrament of Holy Orders. Every ordination marks a step in the seminary. By meditating on the texts of the ordination over the course of the preparatory retreat and by the prayers which they offer up to God every day, the seminarians continually come to a better understanding of the greatness of the sacrament. These are the great graces of the seminary: slowly but surely drawing nearer to the holy altar of the Sacrifice of the Mass. During the year spirituality, which is similar to the year of novitiate in a religious order, the seminarian learns the principles of the interior life, the life of union with God, and the principles of the spiritual combat implied in that life. When this year is done conscientiously, it has a good effect on all the following years and also on the life of the future priest. During the year of spirituality, seminarians of the Society of Saint Pius X are vested in the ecclesiastical habit. The ceremony of tonsure takes place the following year. The first ceremony which has a profound impression on the seminarians is the taking of the cassock. On that day, they give practical evidence of their complete gift to our Lord Jesus Christ by a definitive abandonment of secular garb, clothing themselves in the ecclesiastical habit, the cassock. Besides its symbolic value, the cassock is also a protection for the one who wears it and a powerful means for apostolate. Though the taking of the cassock is an important event for the seminarian, the tonsure is more so, because it inducts him into the clerical state, consecrating him to the divine ministry, placing him in the hierarchy of the Church and thus preparing him for the reception of Holy Orders. The Church, founded by Jesus Christ, is a perfect society, always living and fruitful, caring for its own members and perpetuating itself. Being in its essence one and hierarchical, it is composed of clerics and lay folk, of superiors and inferiors, and is governed by bishops, who themselves submit to the authority of the Supreme Pontiff. Porter is the first of the minor orders. The Porter has the duty of opening and closing the church, of expelling from it people who should not be there, and of watching over the sacred vessels, vestments, and so on. The particular virtue required of the Porter is zeal for the house of God and for souls. During his ordination, the Porter receives from the bishop a set of keys. They are a symbol of the house of God and of all that is contained in it, since the Porter is the guardian of that house. The Porter also rings the church bell, because part of his function in the service of the Mystical Body is to call the faithful to the ceremonies of the church. The second minor order is that of lector. The duty of the lector is to read the sacred books, especially during the office of Matins, and to teach catechism. He can also bless bread and new fruits. His particular virtues are the love and study of holy Scripture, as well as zeal for the sanctification of the faithful. He must have a profound faith in order to fulfill his functions holily. During his ordination, the lector touches the book of liturgical readings, as a sign of his new mission. The third order is that of exorcist. The primary power that he is given is that of casting out demons from the body of the possessed and also keeping demons away from the faithful. His particular virtues are purity of heart and mortification of the passions. The exorcist touches the book of exorcisms, a symbol of his function. The fourth and final minor order is that of acolyte. The acolyte is able to participate in a much closer way in Holy Mass, which participation is the primary end of the sacrament of Holy Orders. This participation is accomplished by the acolyte when he assists the sacred ministers by presenting to them the wine and the water which are to be the sacramental matter for the sacrifice. The acolyte must strive to live a chaste life, according to the greatness of the ministry which he exercises. At his ordination, he touches the cruets and receives a certain power over the offerings which he brings to the altar. There is nothing more divine, says St Thomas, than the object of Holy Orders and the sacrament of the Eucharist, namely, our Lord Jesus Christ Himself. The priest pronounces the words of consecration, touches the body of our Lord, and gives it to souls. The deacon can approach very closely to the Blessed Sacrament, even so far as to be able to touch the body of our Lord Jesus Christ. The subdeacon looks particularly after the sacred vessels. These three orders are major orders, because those who receive them have power over sacred things, and so they must have a level of purity that is still greater than those who are in the other orders. At a Solemn High Mass, the subdeacon has the duty of presenting the paten and the chalice to the deacon, of pouring the water in the chalice, and of chanting the epistle. Besides this, he is also entrusted with the duty of purifying the sacred linens. Initial admonition: at the beginning of the ordination, the bishop informs the subdeacons that they will be bound to perpetual chastity, and that no one can be admitted to this order unless he has the sincere desire to commit himself to celibacy. Litany of the saints: the ordinands prostrate themselves on the ground, as a sign of humility and adoration, just as the patriarchs and prophets of old did. In that moment, the Litany of the Saints, the favorite prayer of the Church, is sung, in union with all the host of heaven. The litany presents to the most holy Trinity all the merits and works of the God-man. This prostration and litany also precedes the conferral of that the diaconate and the priesthood. Touching of the instruments: the ordinand becomes subdeacon upon touching the chalice and the paten. Prayer for the new subdeacons: the bishop prays for the subdeacons that God may grant them the grace to fulfill their duties well, and that the gifts of the Holy Ghost may be bestowed for them to be vigilant guardians of the altar during the sacrifice. Clothing in the sacred vestments: the subdeacon is clothed in the amice, maniple, and tunicle. The Church commands subdeacons to recite the breviary every day, so that they might be continually lifting up their minds to God. Their new state demands of them a profound spirit of faith and the practice of purity, not only that of the body, but also that of the heart. The deacon is the primary assistant of the bishop or the priest at the altar. He sings the gospel and can be assigned to preach the sermon. In certain cases, he is the extraordinary minister of baptism and of the administration of holy Communion. Clothing in the sacred vestments: the deacon is clothed in the stole and the dalmatic. The deacon must strive to lead a pure life and to preach by his example as well as by his words. May he be, like Saint Stephen and Saint Lawrence, a worthy minister of the altar, and pleasing to God by his virtues! At Holy Cross, ordination to the diaconate takes place at the end of the next to last year of studies. During the final year of studies, the deacons undergo their proximate preparation for the priesthood. They learn to say Mass, they have classes on pastoral theology in order to understand the difficulties of the ministry, they begin to preach and they can also administer the sacrament of baptism and give Communion to the sick. The deacons are the most senior among the seminarians, and they provide a model for the others in the common goal of attaining the grace of participation in the priesthood of our Lord Jesus Christ. First admonition: the prelate describes the functions of the priest and invites the ordinands to practice the virtues necessary for their new state. Imposition of hands: the bishop imposes his hands on the head of each ordinand, an action which constitutes the matter of the priesthood. All the priest attending the ceremony repeat the same action, following the bishop. Clothing in the sacred vestments: the new priests receive the stole and the chasuble. Consecration of the hands: the hands of the ordinands are anointed in the form of a cross with oil of catechumens. Touching of the instruments: each ordinand touches a chalice that contains wine and water, and is covered with the paten that contains an unconsecrated host. The bishop then declares to the new priests that they have the power to celebrate holy mass for the living and the dead. Sacrificial part of the Mass: the new priests offer the sacrifice together with the bishop. The pontiff performs the gestures of the ceremony alone, but he pronounces all the words of the Mass in a voice sufficiently loud so that the priests who are celebrating with him can hear the words and say them with him. The power to hear confessions: after Communion, the bishop confers upon the new priests the power to hear confessions, using the very words of our Lord. Consecratory blessing: this blessing confirms the young priests in the high dignity of their functions. After Mass, the new priests give their first blessings and, on the following day they celebrate their first Mass. The long years of formation have reached their holy end and the Church of God now has more ministers to accomplish her divine mission to save souls. "Dominus pars hereditatis meæ et calicis mei. Tu es qui restitues hereditatem meam mihi."